Located in the heart of downtown Austin overlooking Lady Bird Lake, Waller Creek Boathouse is the ultimate summer day destination. 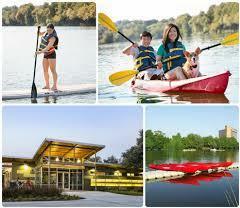 The boathouse features access to Congress Avenue Kayaks, the Austin Rowing Club and Rō Fitness. In addition to adventures on and off the water, Waller Creek offers facility rental for social events, concerts and more, while Alta&apos;s Cafe serves up espresso, craft beer, sustainable wine, smoothies and a full menu that includes artisan sandwiches and fresh salads. Q: How does Waller Creek Boathouse stand out from other Austin venues? A: Waller Creek Boathouse has something for every visitor to our city. Whether you want to have fun kayaking, get a bit of exercise in with Ro Fitness or just hang out, Waller Creek Boathouse can meet a need for everyone in the family. 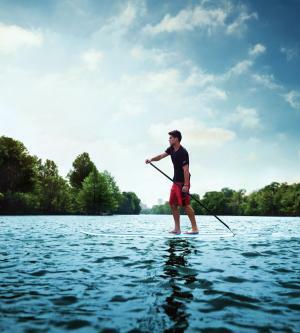 Q: Any Waller Creek Boathouse tips for first-time Austin visitors? A: Located along the Hike and Bike Trail, minutes from downtown&apos;s restaurants and bars, and behind the Four Seasons and near several other hotels, we&apos;re a great base for exploring Austin. Enjoy drinks and snacks on the deck of Alta&apos;s Café while watching the bats fly from Congress Avenue Bridge. Q: Something not many folks know about Waller Creek Boathouse? A: Waller Creek Boathouse is owned by the Austin Parks and Recreation Department and managed by the Austin Rowing Club, a non-profit organization. Q: Tell us about your kayak tours -- Any in particular you&apos;d recommend for certain groups? A: Kayak tours and rentals along with standup paddleboard rentals are run by Congress Avenue Kayaks at Waller Creek Boathouse. During the summer they offer two guided tours: the tour of downtown is great for families, and the evening bat tour is great for both families and college-aged groups. Q: Favorite picks from Alta Café? A: My personal favorite is the Organic PB&J with a gluten free brownie!